Congratulations! You’re now engaged to the love of your life. We can’t wait to hear your proposal story! Getting engaged is a rush and is so exciting, but what should you do after the ring is on your finger? You should definitely share the news with family, take lots of pictures, and of course update your relationship status across social media! After all of that is done, where should you begin your wedding planning? Here’s what to do after you get engaged! 1. Celebrate and Spend Time Together! First of all, the most important part about being engaged is enjoying it! Spend time together and relax for the first little bit. Wedding planning can be overwhelming, so taking time for each other is a great building block to a successful marriage. Find out what things are important to each of you on the wedding day and use the things that you each value to help you create a plan for your day. One of the most important things to do after you get engaged is to talk to each other, or whoever will be paying for the majority of the wedding, to come up with a basic budget. Before you approach any vendors you need to have an idea of how much you will be willing to spend. There are vendors for almost any budget, but be aware that experience and the quality of vendors usually match their price as well. While you are working on creating your budget, you should start creating a rough draft of your guest list. A guest list is important to helping you know how much everything will cost, and it will also help you to know what size of a venue you’ll need. The size of your guest list is also a question that many vendors will ask you when you inquire with them. However, realize that it is early in the planning phases and it’s totally fine for your numbers or your budget to change a bit the more you plan. 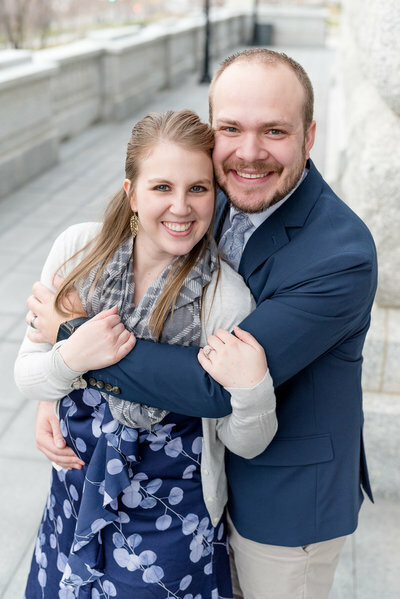 If you are getting married in an LDS temple, consider how many people you will want with you in your sealing room. Temple sealing rooms only have so many seats, and each temple has different options to choose from. Your next big step is going to be setting a date. If you know where you want to be married, be sure to check the venues availability and see if you need to make any adjustments. Are you getting married at an LDS temple? If so, be sure to check with the temple for time slots and make sure they aren’t closed for cleaning. If you aren’t sure of where you want to get married, now’s the time to do some research! When you are looking at wedding venues, consider the style of the venue, its location, and even the hearts behind the people who are running it. Our favorite venues are the ones that have neutral colored walls, and lots of windows. We also love to work with wedding venues that put our client’s needs first and have a service centered culture. If you have a photographer that you know you want for your wedding day, then it is totally fine to approach them before your venue to make sure that they are available for the date you are thinking of. If we are already booked the wedding date that a client inquires for, it’s not unheard of for couples to end up changing their date by a few days to make sure that they can have us at their wedding. When you are choosing a photographer, be sure that you find one that knows what you value and what you want from your wedding photography. We also highly recommend looking for photographers that provide a second shooter and are a service focused business. Find someone that is client obsessed and that will work to put your needs first. Naturally, you should also find photographers that fit with your personality and style. 5. All the Fun Details! Once you have your photographer, your wedding venue, and your date all nailed down, you get to start planning the details or what we call the fun stuff! Use Pinterest as much as you can because you’ll find all kinds of ideas. You may even find vendors that you love from pins you share! Start pinning and research the colors you want to have, cake artists, florals, decorations, invitation suites, etc. While you’re pinning, find us on Pinterest at @jessieanddallin. We also have lists of vendors we’ll send to you to help make this part of your planning fun, and a lot less stressful! We hope this gave you a good outline of what you should do after you get engaged! When our couples book us for their wedding day, we love to do anything we can to help make their planning process less overwhelming. One of our favorite things to give our brides is our Wedding Planning Guide magazine, which we deliver as soon as they book us for their day. Are you recently engaged? We’d love to chat with you about your plans and ideas! Click here to get in touch!